Atkins is more than just a diet—it’s a healthy lifestyle that focuses on weight management from day one, ensuring that once you take the weight off, you’ll keep it off for good. And The New Atkins for a New You Cookbook features recipes with a broad range of carb counts, providing the perfect plan for a lifetime of healthy eating. 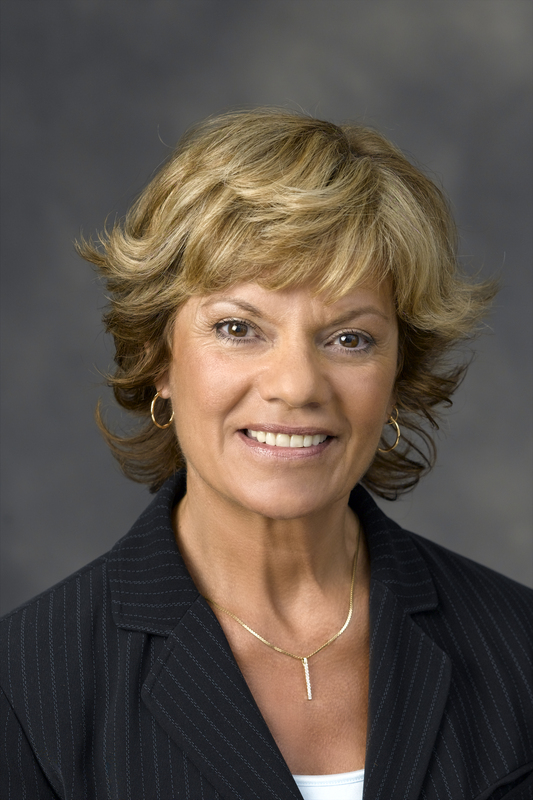 In a nutshell, the New Atkins Diet adheres to the underlying principles that Dr. Robert C. Atkins set forth four decades ago but includes modifications that allow for greater flexibility. Some of these subtle but substantial shifts are simply the result of a greater understanding of human metabolism and food science. For example, now that we understand that fiber doesn’t significantly impact blood sugar levels, it means that you can eat lots more high-fiber veggies than Dr. Atkins originally allowed. As the sales of The New Atkins for a New You evidence, even forty years after Dr. Atkins introduced his diet, interest in his low-carb diet remains high. Moreover, many individuals who don’t follow the program per se do watch their carbs. (If you’re one of those people, this book’s for you, too.) People also increasingly understand that going on any quickie diet to lose 10, 20, or even 100 pounds and then returning to their earlier way of eating won’t result in permanent weight management. Only by adopting lifestyle changes, including a regular exercise program, is it possible to maintain weight loss. Meanwhile, there’s also greater understanding on the part of the medical, nutrition, and research communities that the causes of obesity are more nuanced than once assumed. Most health professionals have slowly but surely come to understand that being overweight is not just a matter of overconsuming calories. It’s now widely acknowledged that it’s not just the quantity but also the quality of the food we eat that has played a major role in the obesity epidemic of the last several decades. Atkins is a diet in the primary sense of the word: a way of eating. It’s also a healthy way of eating. A large body of scientific research now associates heavy intake of sugar, white flour, and other refined carbohydrates with an increased risk for high triglyceride levels, low HDL (“good”) cholesterol levels, and elevated blood pressure. These markers play a large role in increasing the risk of developing heart disease, type 2 diabetes, and other disease conditions. In fact, more than sixty studies support the principles upon which the Atkins Diet rests. We’ll look at what’s new about Atkins shortly, but first let’s look at how burning fat, including your own body fat, for energy continues to be the governing principle of the Atkins Diet. If this is your first exposure to the Atkins Diet, here’s a quick snapshot of how it works. Your body burns both carbohydrate and fat—both, along with protein, known as macronutrients—as fuel for energy. Most people instinctively understand what fat and protein are and which foods contain them, but carbohydrates are a bit more elusive. They’re found not just in grains, cereals, pasta, bread and other baked goods, and potatoes, but also in leafy greens and other vegetables, fruits, nuts and seeds, legumes, and dairy products. (Most of these foods also contain fat and/or protein as well.) As long as you eat the typical high-carb American diet, your body never gets much of a chance to burn its fat stores for energy. Just as a Prius can run on either its electric battery or gasoline, your body can use either fat or carbohydrate as fuel. When you sufficiently reduce the total amount of carbs you consume and focus on vegetables and other such fiber-rich foods as nuts, seeds, and berries, your body shifts to burning primarily fat, including the stores of fat on your belly, hips, thighs, or buttocks. Adequate protein, which makes you feel full, as does fiber, is also essential. The result of eating this way: unwanted pounds and inches melt away. When you reduce your carb intake and your body is running on a mostly fat metabolism, it’s fine to have olive oil, avocados, olives, and other natural fats (as opposed to the chemically altered trans fats found in hydrogenated and partially hydrogenated oils). That’s why our recipes call for butter, not margarine (some margarines still contain trace amounts of trans fats) or shortening. Natural fats also contribute to feeling pleasantly full. When you do Atkins, you watch your carbs but don’t have to count calories. (The nutritional data that accompany each recipe do include calories. Note that grams of carbohydrates, protein, fat, and fiber have been rounded off to the nearest whole number.) With such satisfying meals and equally tasty snacks, most people find they aren’t overly hungry when mealtime rolls around, enabling them to control their appetite—and ultimately their weight. As legions of failed dieters know, when your appetite is stimulated, it’s very hard to ignore the messages your brain (and tummy) are beaming out. That’s where blood sugar control comes in. When you moderate your carb intake, eat high-fiber, nutrient-dense carbs, consume sufficient protein (which is satiating), and have a meal or snack every three or four waking hours, your blood sugar stays on an even keel—and with it your appetite. In contrast, when you skimp on fat and protein and fill up on carbohydrates—which quickly convert to glucose (sugar) in your bloodstream—your blood sugar level rises quickly. Then a few hours later, it plummets as you run low on fuel, making you hungry, jittery, or sleepy—and craving another fix of high-carb foods. We call this the blood sugar roller coaster. It’s almost impossible to control your appetite when your blood sugar is careening up and down. Doing Atkins almost immediately puts the blood sugar roller coaster out of business. The Atkins Diet is designed to allow you to transition from a relatively restrictive eating program to an increasingly liberal one. The first two phases are designed for weight loss; the third is initially for weight loss and then becomes a dress rehearsal for Phase 4, which is all about weight maintenance. By gradually introducing more grams of carbohydrate while simultaneously broadening the array of carbohydrate foods, you stay in control of your intake, learn to identify foods you have trouble eating in moderation, and ultimately segue into a permanent, sustainable way of eating—a diet for life. Let’s take a brief look at the four phases. The only carbs that matter when you do Atkins are Net Carbs, aka digestible carbs or non-impact carbs. In whole foods, such as vegetables, fruits, or cheese, you simply subtract the number of grams of dietary fiber in the food from the total number of carbohydrate grams to get the grams of Net Carbs. Why discount fiber? Although it’s considered a carbohydrate, fiber doesn’t impact your blood sugar level the way most carbohydrates do. Let’s do the numbers: ½ cup of steamed green beans contains 4.9 grams of carbs, of which 2.0 grams are fiber, so subtract 2.0 from 4.9 and you get 2.9 grams of Net Carbs. Here’s an even more dramatic example: 1 cup of romaine lettuce contains 1.4 grams of carbs, but more than half the carbs (1.0 gram) are fiber, for a Net Carb count of 0.4 gram. With packaged foods, simply check the Nutrition Facts panel and again subtract fiber grams from total carb grams to get the Net Carbs. Low-carb products, such as sugar-free chocolate, may use sugar alcohols as sweeteners. Moderate portions of sugar alcohols, including glycerin, don’t impact blood sugar, and therefore their grams can also be subtracted from the total number of carb grams. Phase 1, Induction, which kick-starts weight loss, is where people usually begin. Induction lasts a minimum of two weeks, but it’s perfectly safe to remain here for weeks or even months if you have lots of weight to lose. You’ll consume 20 grams of Net Carbs daily (see “What Are Net Carbs?” above), primarily from leafy greens and other non-starchy vegetables. You’ll also be eating eggs, poultry, fish and shellfish, meat, cream, aged or firm cheese, and olive oil and other natural fats. (After two weeks, you can introduce nuts and seeds, but remain at 20 grams of Net Carbs.) This phase excludes any form of sugar, fruit and fruit juice (other than lemon and lime juice), flour and other grains, and starchy vegetables. Phase 2, Ongoing Weight Loss, or OWL, is where you’ll shed most of your excess pounds, eventually finding your tolerance level for consuming carbs while continuing to lose weight. You gradually increase your daily Net Carb intake, first to 25 grams, and then in 5-gram increments as long as weight loss proceeds. At the same time, you add back more carbohydrate foods in small portions, usually in this order: nuts and seeds; berries and other low-glycemic-impact fruit, such as most melons (but not watermelon); cottage cheese, ricotta, and most other fresh cheeses along with plain whole-milk yogurt; and finally lentils and other legumes. Most people stay in this phase until they’re about 10 pounds from their goal weight. Phase 3, Pre-Maintenance, broadens your carb choices to include small portions of additional fruits, starchy vegetables, and finally whole grains. You’ll continue to increase your daily carb intake, this time in 10-gram increments, until weight loss stalls. This is good news, because it lets you know your carb threshold. When you reach it, drop back 5 or 10 grams a day and stay at that level until you reach your goal weight. Remain in Phase 3 for a month, as you practice holding your weight stable. Phase 4, Lifetime Maintenance, is not so much a phase as a lifetime way of eating. Continue to eat the way you did in Phase 3 and avoid added sugar (as opposed to the integral sugars in fruit, dairy, and vegetables), white flour, and refined grains, and you’ll maintain your new weight. If you do start to regain after a vacation or a period of indulgence, drop back to Phase 2 before gaining more than 5 pounds and remain there until you get on track. For more on how to do Atkins and complete lists of acceptable foods for each phase, log on to www.atkins.com or read The New Atkins for a New You. Some of the changes that define the New Atkins Diet, such as permitting caffeinated beverages—caffeine has been shown to modestly benefit fat burning—are fairly small. Coffee or tea can now also count toward two of your eight daily cups of water. But there are several more substantial updates. Overall, the objective is to make the program simpler, more versatile, and sustainable for a lifetime. Some changes relate to eating out, but others take place right in your kitchen. Vegetables are key. Even in the initial phase, we encourage you to eat lots of high-fiber “foundation vegetables.” These include salad greens, tomatoes, green beans, asparagus, and more than seventy other non-starchy vegetables. (Most people can eat the remaining vegetables, such as sweet potatoes and most other root vegetables, winter squash, and even potatoes in moderation, as they approach their goal weight.) We recommend that you eat at least 12–15 grams of Net Carbs in the form of foundation vegetables each day, which translates to at least five servings of salad and cooked vegetables. Transition easily. Previously, people sometimes got trapped in Phase 1 of Atkins, afraid to start adding back carbohydrate foods and stalling weight loss. It can be tempting to lose all one’s excess weight in this phase, but this doesn’t allow you to explore your limits and capabilities. Instead, by moving through the phases of the program, you internalize new eating habits. The New Atkins puts much more emphasis on the natural transition from one phase to another. Recipes indicate the phases for which they are appropriate and often offer suggestions about how to modify them for an earlier phase. By gradually transitioning to a sustainable way of eating, you significantly increase your chances of being able to find the right weight for you—and stay there. Customize to suit your needs. Each of us has a unique body and metabolism. You may be able to consume more (or less) carbs or greater (or less) variety in carb foods than your spouse, daughter, or best friend. Watch your response to foods and recalibrate accordingly. You can also decide to start in Phase 2 or Phase 3 if you prefer to swap slower weight loss for more food choices. Or if you’re already at a good weight and are interested in following a lowcarb program for health reasons, simply start in Phase 3. We advise vegetarians to start in Phase 2 at 30 grams of Net Carbs, so nuts, seeds, legumes, fresh cheese, and yogurt are on the menu from the get-go. Vegans, too, can start in Phase 2, but at 50 grams of Net Carbs to allow larger portions of nut, legume, and grain dishes. Variety is the spice of life. Dissatisfaction with a short list of acceptable foods and the resultant boredom torpedo most weight loss diets. On a typical calorie-restricted diet, the day comes when you simply cannot consume one more tasteless low-fat meal. Before you know it, you’re “sneaking” some of your favorite forbidden foods. It’s usually all downhill from there, as you abandon a way of eating that denies the perfectly normal desire to savor food. Because nuts, eggs, butter, cream, olive oil, and even chocolate and ice cream (made without added sugar, of course), and other satisfying foods are permitted on Atkins, you’re far more likely to stay the course. Main dishes generally contain no more than 7 grams of Net Carbs per serving. Appetizers, soups, sides, snacks, and desserts generally contain no more than 3 grams of Net Carbs per serving. Omit fruit or fruit juices (other than lemon or lime juice), fresh cheeses, yogurt or milk (reduced-carb dairy beverages and plain unsweetened soy milk, almond milk, and coconut milk beverage are acceptable), nuts, seeds, starchy vegetables, grains, legumes, and pasta. Alcohol is acceptable only if it has been heated or used in a marinade and discarded. Main dishes generally contain no more than 12 grams of Net Carbs per serving. Appetizers, soups, sides, snacks, and desserts generally contain no more than 9 grams of Net Carbs per serving. In addition to Phase 1 foods, recipes can include nuts, seeds, berries, and a few other low-glycemic-impact fruits; all cheeses; unflavored, unsweetened whole-milk yogurt; tomato or tomato-vegetable (V-8, for example) juice; and legumes. Main dishes generally contain no more than 18–20 grams of Net Carbs per serving. Appetizers, soups, sides, snacks, and desserts generally contain no more than 12 grams of Net Carbs per serving. Recipes may include ingredients restricted in earlier phases, but not added sugars or white flour and other highly refined grains. Note: Personal tolerances for carbohydrates in general and specific ingredients vary greatly. Also please refer to the Recipe Phase Chart, which lists the phases for which each recipe is suitable, as well as whether it is more appropriate time-wise to make on a weekday or over the weekend. In a few cases, a recipe not coded for an earlier phase can be modified, for example, with a smaller portion or swapping out or eliminating one ingredient. Such exceptions are indicated with an asterisk (*). In keeping with greater flexibility, you may also choose to eat a dish coded for a higher phase even if the carb count is higher than advised if the ingredients are acceptable for the phase you’re in. For example, a side salad with lots of foundation vegetables might be more than 3 grams of Net Carbs per serving. As long as you stay within the total number of grams for the day, there’s no reason why you couldn’t have that salad with an entrée low in carbs such as a grilled chicken breast or broiled fish. Or simply have a smaller portion. If you stay longer than two weeks in Phase 1, you can add nuts and seeds in Week 3. This means that you can have recipes coded for Phase 2 that include nuts or seeds but otherwise meet the other requirements for Phase 1. Such recipes are indicated in the Recipe Phase Chart. 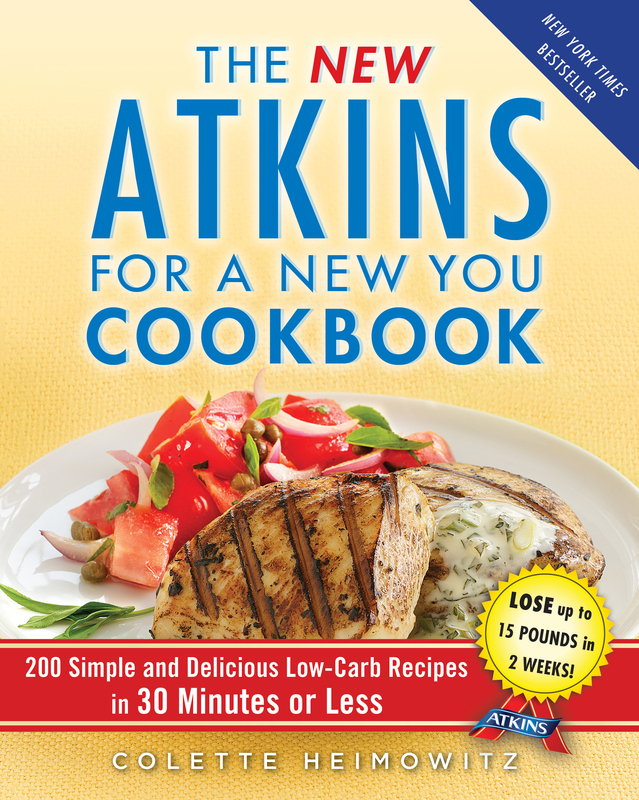 The New Atkins for a New You Cookbook is far more than just a collection of mouthwatering low-carb recipes. It’s also packed with a wealth of helpful information to speed meal preparation and make you feel more in control and confident in the kitchen. That’s why Chapter 2, “The New Atkins Kitchen: Ingredients and Equipment,” provides information on the most common low-carb ingredients and a list of staple foods you should always have in your pantry, freezer, and fridge so you never get caught with “nothing to eat.” You’ll learn how to be a savvy lowcarb shopper, including how to read food labels, along with time-saving meal-prep techniques and the few essential pieces of equipment that will enable you to cook just about anything. The Glossary explains terms you may not be familiar with that appear in recipes. Each recipe lists the active and total amount of time needed and is coded as a weekday (30 minutes or less total time) or weekend (more than 30 minutes total time) meal. Recipe headnotes offer shortcuts to shave off precious minutes, perhaps by substituting cooked shredded chicken from a salad bar instead of poaching a chicken breast, swapping one ingredient for another, or cross-referencing other dishes that would work well as accompaniments. Multiple tips range from how to pit olives and safely defrost frozen foods to how to fold up a burrito and freeze leftover egg whites. I hope I’ve given you a small taste of the luscious delights and practical advice to come in the following pages. I’m excited to share with you these luxurious dishes you can enjoy on the Atkins Diet. The food is so good and so satisfying that you might even forget that you’re on a diet! Here’s to enjoying both the journey of great food that’s easy to prepare and the destination of a permanently slimmer, healthier, more energetic you.